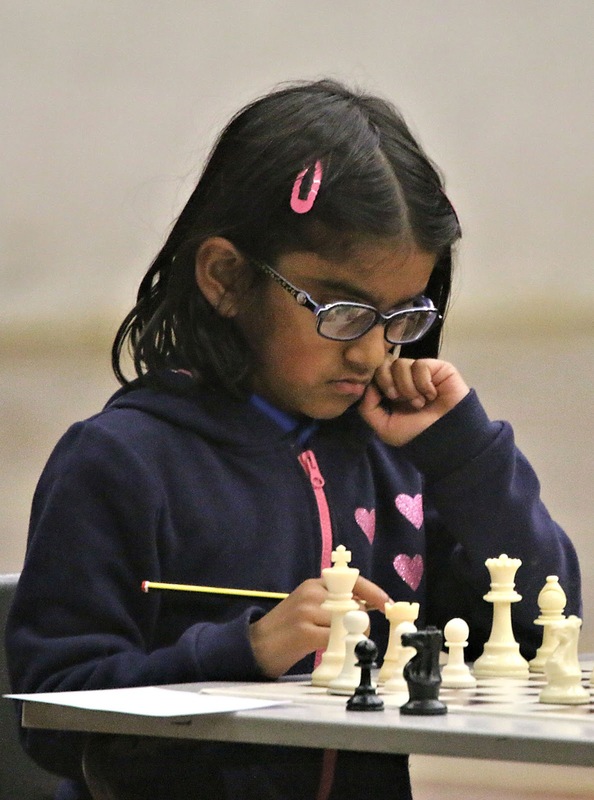 This annual tournament, sponsored by Delancey and organised by IM Mike Basman, takes place in many schools and clubs across the UK during the Spring Term. Those who score well in the local rounds progress to the 'Megafinal', a county-wide tournament. There are then two further stages, the 'Gigafinal', usually in Manchester and the 'Terafinal', which takes place in the Midlands. Bury's juniors have a proud record in this event, first with Alan Merry and more recently with Anita Somton and Adam John; all three progressed to the Terafinal stage, where fewer than 70 players compete for the 'Strat' title from more than 50,000 original competitors. Yesterday, the Bury Knights Junior Club held the first two rounds (of seven). In the first round, William Moody (ECF 96) was paired against Amy John (left), who is just half his age. Amy is the third chess-playing member of the John family (Alan and Adam already play regularly in the adult leagues). Below is the position with Amy (Black) to play. The clocks were set at 25 minutes each and Amy was down to two minutes whilst William had about five minutes remaining. Although only 7½ years old, Amy is a deep thinker and seemed unaware that her time was rapidly running out. The following moves were played, but at the end, with Amy having a mate in one, her time expired, leaving a most relieved William to reflect on his good fortune. 1... Qd5 2. Rf3 Ree2 3. Rg1 Bf2 4. Rf1 Bxd4 5. Rg3 Rxg2 6. Be4? and Amy's flag fell before she could make a move. William had played Be4 instantly, with less than two minutes remaining on his clock. At first glance it looks good, forking queen and rook, but in fact he could not have avoided mate, even if he had played a different move. Given a few more seconds, Amy would have surely spotted ... Rh2 mate! Incidentally, there's a rather neat line (thanks computer) if William had played 6. Rf2 instead of Be4. It goes: 6... Rgxf2+ 7. Kg1 Qh1+! 8. Kxh1 Rh2 mate.